What if Maryville earned a penny every time you searched the Internet? Or how about if a percentage of every purchase you made online went to support our cause? Well, now it can! We have partnered with GoodSearch.com to raise funds for the wonderful work we do. This is how it works; GoodSearch.com is a new Yahoo-powered search engine that donates half its advertising revenue, about a penny per search, to the charities its users designate. Use it just as you would any search engine, get quality search results from Yahoo, and watch the donations add up! When you log onto GoodSearch be sure to select Maryville as your designated charity and start searching. Make GoodSearch.com your default home page. There is also a site that partners with GoodSearch named GoodShop.com it is a new online shopping mall which donates up to 37 percent of each purchase to your favorite cause! Hundreds of great stores including Amazon, Target, Gap, Best Buy, ebay, Macy’s and Barnes & Noble have teamed up with GoodShop and every time you place an order, you’ll be supporting your favorite cause. Just go to www.goodsearch.com and be sure to enter Maryville as the charity you want to support. And, be sure to spread the word! We need YOU to help. You click can make all the difference in the world with helping turn around someone’s life. From the smallest to the largest donation, all funds help build a better tomorrow, today. Thousands of people in New Jersey are touched by the darkness of alcohol and drug addiction. More than a million people have addiction problems in New Jersey and nearly three times as many are affected by another person’s drinking. 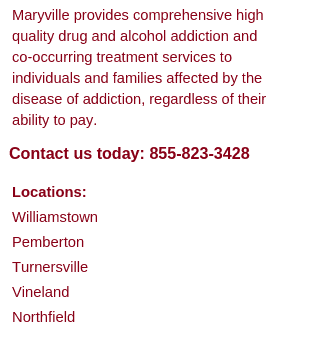 Maryville of New Jersey connects these people with help and hope by providing treatment services and prevention, advocacy and education. Here are just a few example of what your donations are working towards!